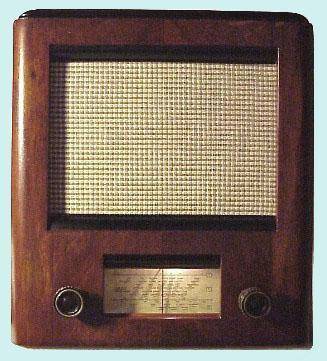 This radio, which I acquired in a garage sale, employs following tubes: UCH11, UBF11, UCL11 and UY11. 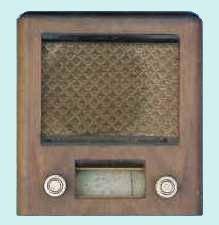 Without doubt it is a Telefunken radio. 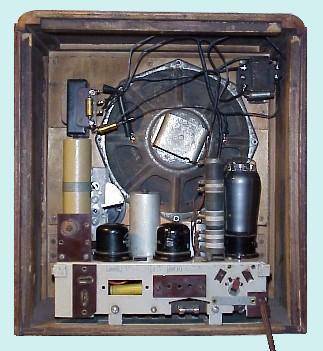 Several Telefunken models appear to match the tube line-up given above. 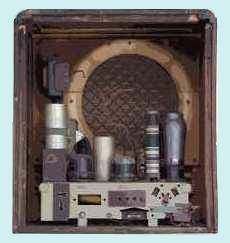 From a schematic point of view models 2B54GWK, B644GWK as well as B744GWK are almost completely identical to my radio, but their cabinets are different (see "Historische Radios" Band II by G. Abele, page 173). It is very likely that a home constructor built the wooden cabinet. The cabinet measures approximately 30,2 x 33,5 x 16,8 cm (width x height x depth). The band switch assembly shows the date 16-8-44 which happens to be my birthdate ! 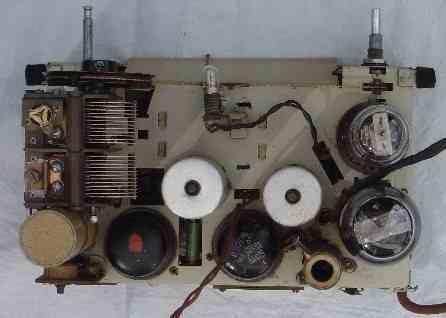 Loudspeaker, dial glass and back panel were missing. 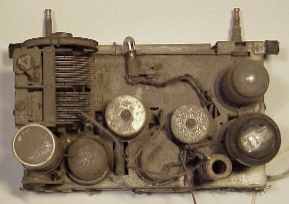 The electrolytic capacitors at the back of the tuning capacitor and beneath the chassis were not original ones and the mains switch on the volume potmeter did not work properly. A small 50 ohm resistor was burnt out as well as the 125 ohm section of the multi-section resistor. The knob for the band switch at the right hand side was missing. All this called for action ! I cleaned the cabinet, dismantled the chassis and replaced all paper capacitors. This was accomplished by emptying the respective housings, placing new high quality components in the original housings and sealing them again with a dark grey, kneadable two-component epoxy. This material hardens after 5 to 10 minutes after mixing the two components by kneading. I further replaced the burnt out resistors and found a replacement loudspeaker and output transformer. The dial glass was reconstructed from an example, using Microsoft Word. The design was printed on a transparant sheet which was attached to the back of a glass plate. The dial design is available as a PDF-file. 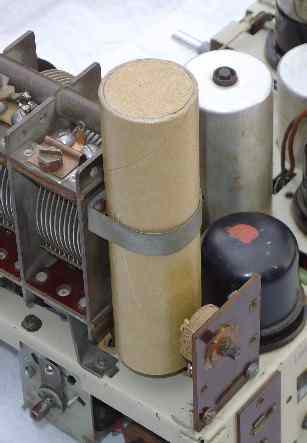 The electrolytic capacitors were reconstructed from cylindrical carton boxes and filled with new components. The housing was given a new coating and a new grille cloth was fixed on top of the damaged original one. Finally the radio was provided with a new mains cord and connector. The knob for the band switch still is missing, but I found a temporary replacement. As regards the knobs in the front, I am not sure whether these are original ones. After having assembled all parts, the radio played very well on all three wave bands and sensitivity and selectivity were quite satisfactory.